I got a new machine at work with Windows 7 on it. 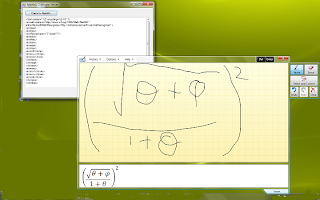 One of the more interesting applications coming with Windows 7 is the Math Input Panel. This is designed for pen input on a tablet-style device and performs pretty impressively accurate recognition of mathematical expressions. While designed for a tablet, it also works pretty well if you are just “writing” the expression with a finger on a small laptop trackpad, which is how I have been using it. I decided to brush up my C# forms programming and produced a small form that shows any MathML on the clipboard. The main code (everything apart from the boilerplate Visual Studio files) is available on google code While it's particularly useful to see the MathML generated by the Math Input panel, it also works with other applications, notably MathPlayer and Word, that place MathML on the clipboard. While looking via Google for some programming tips on my form, I came across a very similar blog posting from last year. That form had some differences though (displaying the IE folding tree view of the XML) so I completed my form here. The screenshot shows the Math Input Panel interpreting my appalling handwriting, and the mmlclipboard form displaying the generated MathML. Wow... This is so impressive! This alone can make me buy a new laptop (or is there a way to use it with a desktop)? You can use a normal mouse to fake the pen input same as a trackpad, but it's perhaps more natural to "write" with a finger on a trackpad than with a desktop mouse. You don't need a whole new machine though: it looks like for a few 10s of pounds or euros or dollars you can get a usb pen/tablet device these days to plug into an existing windows 7 desktop machine. (I haven't actually tried this). Thanks David. MathType 6.6 also accepts input from the MIP, which you can launch directly from MathType or from Word. Since it's possible to launch the MIP from MathType, this also gives one an easy way to insert handwritten equations into PowerPoint. Bob, yes thanks. Hopefully now MathML3 is nearing the end game in the standardisation process and it does now define these clipboard flavours, more tools will look for these flavours on the clipboard to allow MathML-aware cut and paste. That said, I wish MIP was a little bit more forgiving in the clipboard flavors it exports. While it's good to hear that the design science products support this they are math specific, it would be harder to argue that general tools such as oxygen or emacs (or even notepad) should be looking for MathML clipboard flavors and it would be nice if a future MIP exported something a bit more generic in addition to MathML, at least a generic XML label if they want to avoid using the text flavors.